NOTE: This feature is available for accounts on the Starter, Basic, and Professional plans. There are two places to add a new user: in the User tab in settings and directly from a dashboard. You must have the permission in Grow to manage users to be able to add a new user. Adding a new user through the Users tab allows you to edit a user’s permissions in a more detailed view. To begin, click on your name and select Settings. Next, click on the Users tab from the left-hand panel. This will show you the following page. To add a new user, click on the blue Add New User button on the right side of the page. On the next page, you will be able to enter the new user's name and email address, as well as choose the permissions that they will have. If you want to learn more about permissions, check out our help article here. If you do not select any permissions for the user, they will have view-only access in Grow. 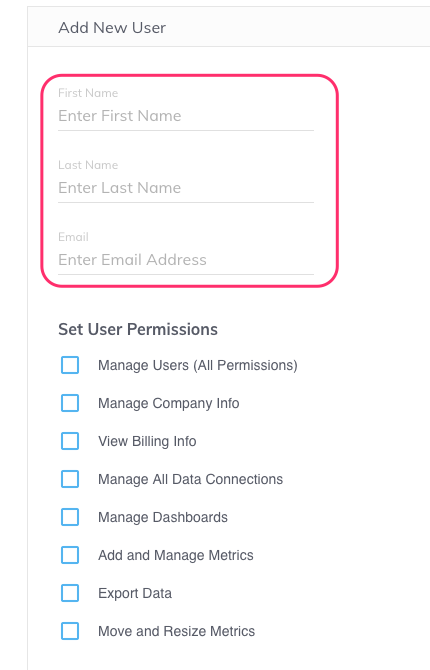 Below the Set User Permissions section, you can select which dashboards to add them to in the Dashboard Selection section. This has a search bar that may come in handy if you have a lot of dashboards. Back at the top of the page, click the blue Save New User button. This will send the same email invitation, and they will now be able to access Grow. To add another user to a dashboard, click the profile icon in the upper right-hand corner of your page. In “Enter Name or Email,” type the name or email of the person you want to add. This will automatically filter through the users in the system for matches. If the person is not in Grow yet, a button will appear to add a new user. Go ahead and click this. This will send the new user an email with a button to activate their account. The link will bring them to a page to set up their password. Once they do, they have access to that dashboard in Grow. If you have many people that you want to add as users in Grow, you can upload a CSV list directly into Grow. 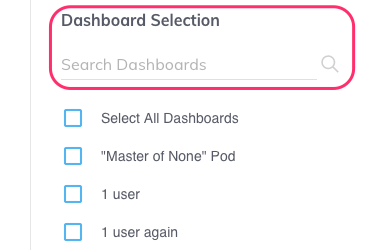 The Dashboards columns needs to be a comma-delimited list of dashboard IDs in a single cell of the dashboards a user should have access to. You can find that ID in the last five numbers of the URL of the dashboard. 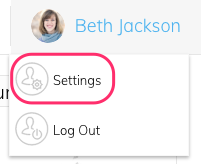 You can also edit dashboard access for specific users later in the User Settings. There may be times when you want to give a user access to a data source without giving them the credentials to connect it to Grow. Fortunately, Grow has made it easy for you to share data connections! Find out how to do that here. The "User Attributes" section allows you to set specific labels for individual users in your Grow account and use them in dynamic dashboards. To use dynamic dashboards, contact your account manager.